I wasn't born with a scar on my forehead. I'm not an heir to a distant kingdom. I was born a rabbit. The destiny I was born to was simply to die in a laboratory. But becoming a hero doesn't happen overnight, and destiny is a funny thing. In one moment, the kindness of a stranger - or, in my case, a vampire - can change everything. 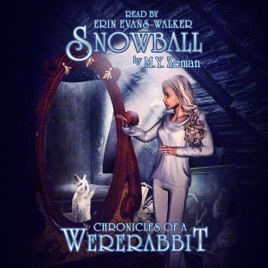 My name is Snow, and I am a wererabbit. Snow Everly was born a rabbit and believed that her destiny was to die in a cold laboratory. Then one winter night, a vampire breaks in searching for his missing research. When the lab goes up in flames, he goes back and rescues her. When she turns three years old, Snow gains the ability to shift into a girl. Why was she created? Who and what are the mysterious figures following her? Follow Snow on her journey as she searches for the answers. Snow's dream is to one day become a hero, and above all else, she wants to be accepted for who she is - a wererabbit.